Kathmandu as a settlment dates back over two thousand years and many dynasties have come and gone over the years.Today Kathmandu acts as the gateway to Nepal Tourism and it is the nerve centre of the country’s economy. The Kathmandu Valley today is a verdant and fertile one,it has always been a major trading hub with tribes from the north from Tibet and beyond meeting their southern neighbors from India to haggle and barter.The Valley is approximately the same size as broader London or San Francisco 570 sq kilometers 220 sq miles. Elevations within the valley range from 1,200mtrs to 1,500mtrs (3937’/4900’) with the surrounding hills rising to over 2370 mtrs (7,700’). The central valley is taken up by a bustling Kathmandu, however by taking a short drive out of the city there are many small settlements where agrarian life has changed little over the years.Dynasties have come and gone here, each has left its mark on the regions rich heritage; the valley contains seven World Heritage Sites. There are three major settlements in the valley; they all have a distinctive character along with outstanding temples and a varied calendar of feasts and festivals. After the death of King Yaksha Mallha in 1482 the valley was divided between his three sons. The following years saw intense rivalry between the principalities, each vying with the other to create the finest architecture. It was during this period (1482 to 1768) that most of the architecture and art seen today originated. The three pricipalities within the valley are Kathmandu itself along with Patan and Bhaktapur and each of them have their own Durbar Squares (palace squares).The following sites in Kathmandu mentioned below are places of main historical interest each of them reflecting the rich cultural heritage to be found in the valley. This complex of palaces, courtyards and temples Hanumandhoka Palace, Kumari Ghar (Abode of the Living Goddess), Taleju temple, built between the 12th and 18th centuries was once the seat of the ancient Malla Kings of Kathmandu. A fascinating piece here is the 17th centuary stone inscription set into the wall of the palace with writings in 15 languages. The square is protected as a UNESCO World Heritage Site and it is very much the social, religious and urban focal point of the city. To this day all the major state and social ceremonies, including the solemnization of coronations are performed in one of the courtyards in this complex. Swayambhunath Stupa sits on the top of a hillock on the western side of the valley just three kilometers west of the city center. The stupa is one of the holiest Buddhist sites in Nepal and its establishment is linked to the creation of the Kathmandu Valley out of a primordial lake. 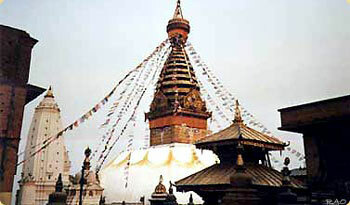 Swayambhu is also known as Samhengu and is also listed as a World Heritage Site. It is one of the oldest and most revered Buddhist shrines in the world and it is said to be over two thousand years. The four sides of the stupa are painted with the eyes of Lord Buddha in fact the temple is also known as the watchful eyes of Buddha. Pashupatinath is also protected by UNESCO as a world heritage site. Pashupatinath is the holiest Hindu pilgrimage destination in Nepal and is the most sacred cremation site in Nepal.There are linga images of Shiva along with the statues, shrine and temples dedicated to other deities in the complex. A temple dedicated to Shiva existed at this site in 879AD.However the present temple was built by King Bhupatindra Malla in 1697AD it has a gold plated roof, silver doors and woodcarvings of the finest quality decorated in the Pagoda style of construction. There are rows of Shiva shrines and Hindu pilgrims come from all over South Asia to offer ( Puja) worship to Shiva.Shiva comes in many forms, here is known for being both the destroyer and creator of life and the protector of wild animals.The Bagmati river a tributory to the sacred Holy Ganges river flows through the complex where the ashes of the cremated are thrown. Bouddhanath was probably built in the fifth centuary it is yet another World Heritage Site within the valley and is one of the largest stupas in the South Asia.Nowadays it has become the focal point of Tibetan Buddhaism in Nepal. The white stupa looms 36 meters overhead. The stupa is located on the ancient trade route to Tibet where Tibetan merchants have rested and offered prayers for many centuries. When refuges entered Nepal from Tibet in the 1950 many of them decided to live around Bouddhanath. They established many Gompas and what is known now as ‘little Tibet’ in Nepal was born. The area around Boudhanath remains the best place in the valley to observe the Tibetan way of life.